How to Have Fun and Keep Your Pup Safe This Spring! Its official, Spring is here! Your dog is probably eager to get outside and smell all those new spring smells. The blooming flowers, the animals, the breeze, the grass. UGH! There is so much out for there for a dog to explore when the weather warms up. And with that, comes a whole new list of dangers as well as things for us humans to be aware of. Take a look at my spring safety tips for your dog. 1. Sniffing those flowers is something both humans and dogs enjoy. Because of that, it is important to be aware of what types of plants/flowers can be poisonous to your dog. If you are curious which plants are toxic, you can view a full list here. 2. Warm weather is a wonderful thing... but warm weather also means bugs. And with bugs come things like bees and bee stings. Has your dog ever been stung by a bee? If not, you would still be unsure if he is allergic or not. It is important to know what to watch out for if your dog does happen to get stung. Symptoms of an allergic reaction would be: minor to major swelling, difficulty breathing, and general weakness. I would recommend heading to a vet if your dog is having a serious reaction. However, if it is more of OUCH type pain from a nosy pup, then it can be treated at home. Most times all you need to do is remove the stinger, and keep the area clean. Tasty, lovely smelling grass. At least, that's the way your dog sees it. Some dogs like to graze here and there and have a few bites of the green stuff. There is absolutely nothing wrong with that, providing the grass has nothing toxic on it such as pesticides. That being said, if you notice your dog excessively munching away on grass, you could be looking at an underlying health issue. It could simply be an upset stomach, but best to have your vet's opinion. This time of year sparks a lot of us humans into doing a big spring clean on our homes. Be mindful of your dog as well as other pets and children in your house when choosing your cleaner. Chemicals can be harmful. Steam cleaning is great, and there are tons of natural products on the market as well! 5. Fleas... ticks.... heartworm UGH! As we talked about above, warm weather brings out the bugs. Aside from having to worry about bee stings, fleas and ticks, are going to be attempting to invade your pet and your home. Prevention is key! Heartworm meds, as well as flea and tick treatment, is of incredible importance this time of year, so don't skimp out! 6. Walking our dogs can be difficult for some during the cold winter months, but now that its warming up, the streets will once again be filled with humans out walking their dogs. Always have a collar and tags on your pooch! The tag should include the dog's name and your phone number at the very least. Microchipping is also a great idea. This way if your dog gets away from you, you have a much better chance of him being returned. 7. Spring is a good time to make sure your dog is all up to date with his vaccinations. Your dog will most likely be making some dog to dog contact while your out walking, so take caution, and vaccinate your dog. 8. Humans aren't the only ones that can get seasonal allergies. Dust, pollen and all that good, sneeze worthy stuff can affect your dog as well. Keep your eyes peeled for excessive itching, hot spots, sneezing, coughing, and licking. If you notice your dog doing any of this, you might be looking at seasonal allergies. Best to contact your vet. 9. With Spring, comes rain. With rain, comes puddles. As much as your dog wants to pull you towards that puddle for a drink, DO NOT let him. Parasites and so many other harmful things could be lurking in those puddles, and can sometimes be fatal for your dog. 10. Take note of any wild animals living or hanging out in your yard. If some little critters have made themselves a home, and could be in danger from your dog, call your city to figure out the best plan of action. Most of all, enjoy the gorgeous spring weather! Yes, there are dangers, but don't let that stop you from getting out there and being active with your pooch. Take the necessary precautions and soak up the warmth! 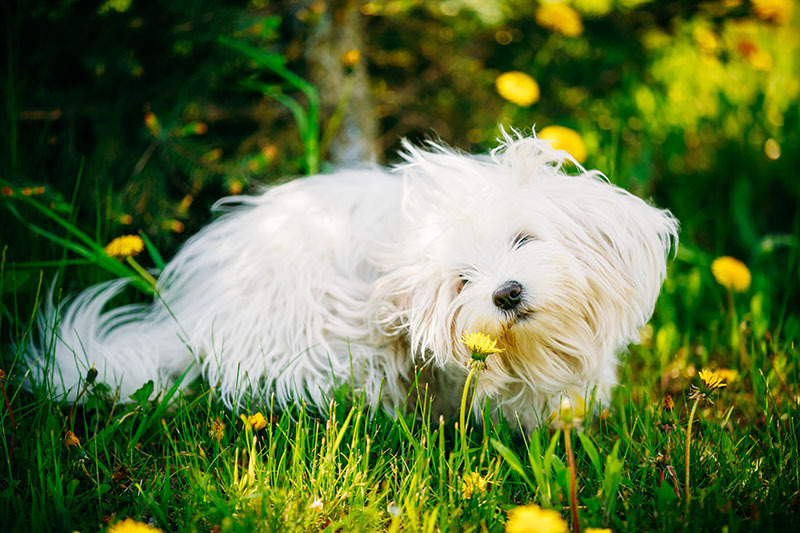 What is your favorite thing to do with your dog during Spring?